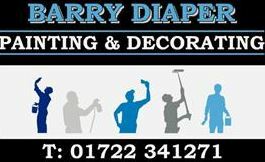 Barry Diaper Painting and Decorating - Painter/Decorator based in Salisbury, Wiltshire. Welcome to Barry Diaper Painting and Decorating. I am a sole trader with over 30 years’ experience in the trade and pride myself on my high quality work and attention to detail, where customer satisfaction is of the highest importance. I am happy to undertake all aspects of interior and exterior Painting and Decorating for Domestic and Commercial clients. I work on Old and New Buildings, and am happy to work on anything from very large projects to very small projects. If you have any questions please give me a call or an email today for a free estimate.